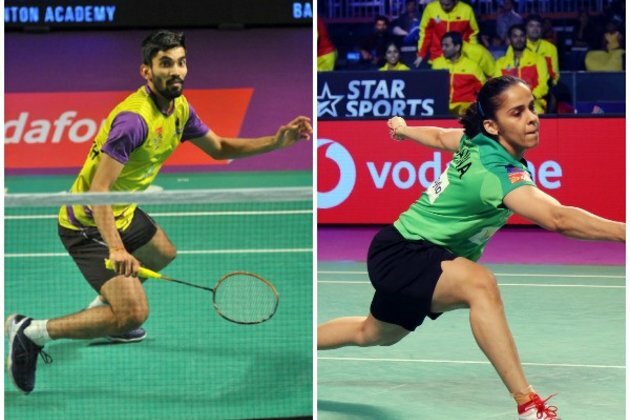 Kuala Lumpur [Malaysia], Jan 17 (ANI): Indian shuttlers Saina Nehwal and Kidambi Srikanth made it to the quarter-final round of the ongoing Malaysia Masters here on Thursday. Nehwal registered a convincing 21-14, 21-16 win over Hong Kong's Pui Yin Yip in the second round of the women's singles event which lasted just 39 minutes. Srikanth, on the other hand, moved past Vincent Wing Ki Wong of Hong Kong 23-21, 8-21, 21-18 in 64 minutes to advance into the quarter-final of the men's singles event. After winning a close first game, the Srikanth seemed to have lost touch in the second game which he lost badly to Yin Yip. The world number eight shuttler, however, made a strong comeback and won the deciding game 21-18. Now Nehwal will take on Japanese shuttler Nozomi Okuhara to book a spot in the semi-final of the tournament and Srikanth will be facing Son Wan-Ho of Korea in his quarters clash. Later, another Indian shuttler Parupalli Kashyap will take on Anthony Sinisuka of Indonesia in the men's single event.